Chococlate-covered ginger and coconut cake. We watched a movie the other night because the Guardian UK told me to and because it was written by (and starred) someone I admire. Well! The Guardian UK and the writer of this film are no longer my BFFs, because it was a bad film. It was a disappointing film. And it wasn’t even an originally bad film. It was just like every other film in its genre in every way; plot, platitudes, humor, prom scene. Ugh. Here’s the message of the film, delivered with a big self-righteous group hug: It’s not okay to be mean to people who are uglier and less fashionable than you are. Not okay! If you’re pretty, you have to be nice to ugly poorly-dressed people, and they’ll be very grateful for the attention. And that’s it. This is the kind of thing that makes me feel like growling–it’s not just stupid, it’s also dangerous because it cements stereotypes of human aesthetics that are just absurd. Nobody is prettier than anybody else. Even on a completely superficial level, ideas about what makes a person beautiful have changed so much throughout history, and they continue to change so much from country to country and culture to culture, that it becomes ridiculous to need to decide that one person is more beautiful than another. And it’s even more farcical to judge a person on their sense of fickle fashion, as any of the sharp, popular kids from 80s movies will tell you. Oh, how foolish they look now! People become more beautiful as you get to know them, the more so the more you like them. It’s not the symmetricality of a person’s features or the color of their eyes that makes them appealing, even on a purely aesthetic level, but the light cast in those eyes by ideas, by emotion and wit and understanding. It’s the way that each person is different from everybody else, the way that they’re strange to you. It’s the fact that they change with every changing mood and every passing year. The fact that they’re inexplicable and new with every shifting expression. If you were to make a movie about one of the token “ugly” people in any of these popular-kid films, and focus on them to the extent that we understand their story–that we hear their jokes and see their dreams and their talents, they would become the beautiful ones. Everybody finds different characteristics appealing, and it’s so damaging and limiting to suggest that the world is some sort of non-stop beauty contest with a very narrow-minded set of judges. And I’m speaking here merely about visual attraction. Not about “inner beauty” (yes, yes, it’s a sappy cliche, but no more so than the idea that barbie dolls constitute ideal beauty.) And not about the fact that vision is only one of the senses, and not the most important sense, in determining physical attraction–not more important than touch, taste, smell, sound. Not more important than all of those. It makes me sad to think that the “pretty” people in this bad movie and, I’m afraid, in life, are popular because we’re told that they should be by dumb movies and by magazines, and we’re foolish enough to buy it. Yeah. Join me next week for my rant on the idiocy of the whole concept of popularity! I made this cake for a client who was holding a wine tasting featuring Australian shiraz. The client (henceforth known by her actual name of “my mom”) wasn’t looking for specifically australian foods, but I thought it might be fun to find something sort of Australian anyway. So I based this very loosely on cakes made by Dan Lepard, and written about in the pages of my former BFF, The Guardian UK. I think the strong flavors of ginger and bittersweet chocolate and marmalade go nicely with the very rich and flavorful wine that is Australian shiraz, any way, whether they be typically australian or not. This turned out to be a big handsome cake, and not at all difficult to make either. Here’s Strange, by Screamin Jay Hawkins, about the unusual woman that he finds beautiful. 1 cup candied ginger – chopped into small pieces. In a large bowl, cream the butter till light and fluffy. Beat in the sugar, and then the eggs, one at a time. Beat in the vanilla. Stir in the flour, baking soda, salt and baking powder. MAdd 1/2 cup milk, and mix till you have a light smooth batter. Process the coconut briefly so that it’s coarsely ground–not so flaky. Stir this into the batter. Stir in the ginger. Butter and flour two cake pans. I also make a square of tin foil to fit the bottom of the pan, and butter and flour that, too. Pour the batter evenly into the cake pans, and bake for 25 – 30 minutes, until they’re puffed and dark golden, and they spring back when you touch them lightly. Let cool and remove from the cake tins. Place one cake on a pretty plate. Spread orange marmalade on top, and then place the other cake over it. In a saucepan over another saucepan full of water, melt the chocolate. When it’s thin and smooth, pour it over top of the cake, spreading with a knife or spoon and steering it down the sides of the cake. 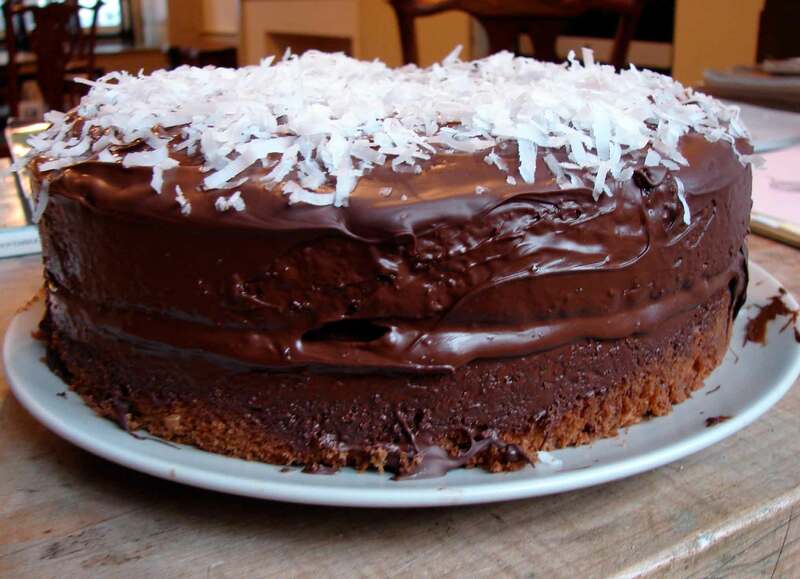 Sprinkle the coconut on the melted chocolate, and then put the cake in a cool place to give the chocolate time to set. This entry was posted in cake, chocolate, dessert, recipe and tagged candied ginger cake, chocolate covered cake, ginger coconut cake, lamington cake by Claire. Bookmark the permalink.